After an adult lifetime of working since I was 17 years old, including 15 years at San Diego State, I have put in for retirement from my job at SDSU. That’s a total of 40 years in the workforce. I need a little break. SDSU has been, without a doubt, the best job I’ve had. Each job I’ve held has brought me many things – from great people who became friends, to new skills learned, or some important life lessons. Some jobs have been more challenging (i.e., dysfunctional) than others, but they brought something I could hold on to. SDSU gave me a chance to apply my skills in communications to my passion for education. As a first-generation college student, I am a personal testament of how education can change one’s path in life and bring opportunities that weren’t considered before. Plus I met some pretty amazing people on campus. I have illustrated this post with Fiona, my old lady dog, visiting campus, but I have to warn potential applicants that bringing your dog to work is not a normal, daily routine. When you do, bring your doggie poop baggies. We have a beautiful, well maintained campus. Email me with any questions about this position. For me, it will be a semi-retirement. I plan to take off the months of July and August for some travel and household projects. And just a little bit of some plain, damn fun. I will launch my freelance business in mid-September. But not before spending a weekday at the zoo or the park or lunch with a friend. You might find me hiking around the Cuyamacas or some other trail. I like the idea of actually taking the time to watch the sun set over the Pacific Ocean. Plus spending time with people I care about and, of course, my dogs. I must get that Augie Doggie to get over his anxieties and become a pack lieutenant. Hey Sis, I have a zoo pass………..we can go together. Oh wow, Sharon! A big Congrats and Very Best Wishes to you. How exciting! Please keep us informed of your freelance business. You will be missed greatly at SDSU, that is for sure. …it’s rare that I am without words, but right now I am. Thank you, Sue. You are definitely one of the amazing people that I met at SDSU. You have influenced me more than you know. Thank goodness for Facebook that we will stay in contact after I retire. Let’s plan on a lunch before I go. Thanks again! 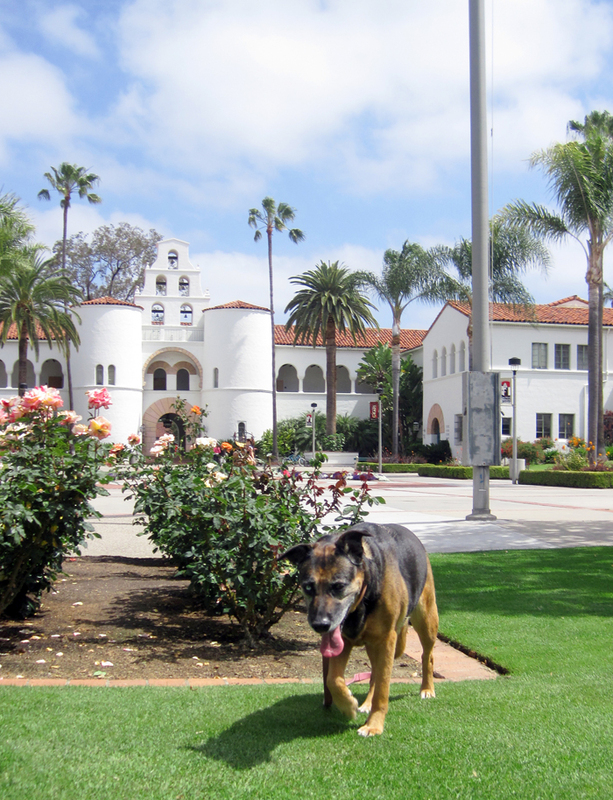 SDSU’s loss, and freelancing’s gain! Kudos to you, and hugs to Fiona!